The 2,730-square-foot home at 45 Berryessa Way was listed in September 2015 for $4.2 million. Hillsborough's most recognizable piece of real estate is now up for rent on Airbnb. 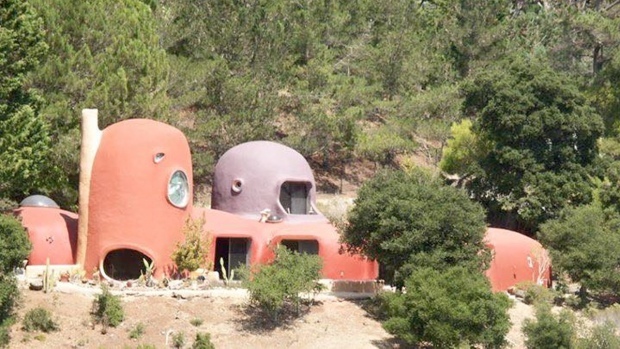 The Airbnb listing on Friday shows the so-called "Flintstone House," a 2,730-square-foot home at 45 Berryessa Way, can be rented for $750 a night. The property was listed on the market for just over a year. In September 2015, the home was up for sale for $4.2 million. This past summer, the price dropped to $3.2 million. Hillsborough's most recognizable piece of real estate has hit the market. Ian Cull reports. Visible from Interstate 280, the 40-year-old, three-bedroom, two-bathroom house is striking for its amorphous dome shapes made of wire and shotcrete. According to Redfin, the last sold price was $800,000 in 1996. Listing agent Judy Meuschke gave NBC Bay Area an exclusive tour of the home in September 2015 — through the brightly-hued conversation pit and into the quirky kitchen. "We felt that's a pretty good price for a landmark," Meuschke said of the $4.2 million asking price at the time.